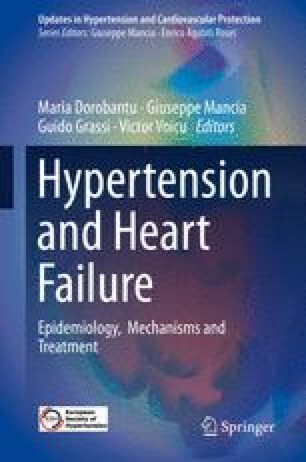 Two concepts have gained a growing audience these last years: the pressure amplification between central and peripheral arteries in response to arterial stiffening and pressure wave reflection and the left ventricle (LV)-arterial system coupling in heart failure (notably with preserved ejection fraction also referred to as diastolic heart failure) as arterial stiffening can result in impaired active ventricular relaxation and passive ventricular compliance. The aims of this chapter are (1) to detail the haemodynamic characteristics of the arterial circulation in order to explain why it is important to measure arterial stiffness and central BP in hypertensive patients, (2) to describe the various non-invasive methods currently available to measure arterial stiffness and central BP and (3) to discuss how arterial stiffness and central BP measurements can help understanding the relationship between hypertension and heart failure. This work was supported by INSERM, Assistance Publique—Hopitaux de Paris, and Paris Descartes University (SL).